Amateur skywatchers have spotted what appeared to be a new fireball from yet another apparent impact on Jupiter ? the third in 13 months for the gas giant. Amateur astronomer Masayuki Tachikawa of Kumamoto city, Japan, caught the fireball on video Aug. 20, according to the website Spaceweather.com, which monitors space weather and other cosmic events. A separate image of the fireball was later confirmed by another Japanese amateur astronomer, Aoki Kazuo of Tokyo. Kazuo recorded a flash on Jupiter at the same time and in the same place on the gas giant that Tachikawa did, Spaceweather.com reported. In addition to supporting the likelihood of an impact, the separation between the two observers ? over 490 mile (roughly 800 km) ? excluded the possibility that the flash came from an event near Earth, explained Spaceweather.com's Tony Phillips. Jupiteris no stranger to violent impacts. The fireball came just 13 months after a spectacular crash that scientists now think involved an asteroid about 1,600 feet (500 meters) wide. The July 19, 2009, collision created a bruise on the planet the size of the Pacific Ocean. OnJune 3 of this year, Australian amateur astronomer Anthony Wesley reported seeinga flash on Jupiter while watching a live video feed of the planet from his telescope. Inthe Philippines, amateur astronomer Chris Go confirmed the discovery from hisown simultaneous video recording of the transitory event. Astronomers around the world determined that some object must have whacked the gas giant in order to unleash a flash of energy bright enough to be seen 400 million miles (643.7 million km) away. There was no visible scar or debris cloud from the June 3 impact, so astronomers were unsure how deeply the object penetrated into the atmosphere. The Hubble Space Telescope's sharp vision and ultraviolet sensitivity were called into action. TheHubble Space Telescope's sharp vision and ultraviolet sensitivity was calledinto action to seek out any traces of the aftermath of the June cosmiccollision. Images taken June 7 showed no sign of debris above Jupiter's cloud tops. That suggests the object did not descend beneath the clouds and explode as a fireball, astronomers said. 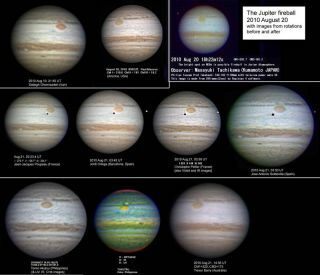 "Likethe event of June 3rd, this fireball did not produce any visible debris,"John Rogers, director of the British Astronomical Association's Jupitersection, told Spaceweather.com. "As the observers commented, there was novisible mark (not in RGB, nor UV, nor methane), post-impact. Dark brown spotson the North Equatorial Belt were already there before the fireball." TheJune 3 mystery fireball was later identified as a giant meteor that plunged into the planet'satmosphere and burned up high above its cloud tops, according scientists whoused observations from the Hubble Space Telescope. In1994, the comet Shoemaker-Levy 9 broke into more than 20 pieces and peltedJupiter repeatedly. At the time, astronomers estimated such impacts could occuron Jupiter every 50 to 250 years. Withthe recent collisions occurring less than a year after the July 2009 incident,researchers are rethinking current estimates of the frequency of such planetaryimpacts on Jupiter.